Insulin is only shipped Monday through Thursday to ensure temperature controlled delivery. Insulin is also non-returnable. 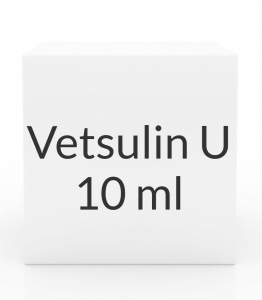 IMPORTANT: HOW TO USE THIS INFORMATION:***VETSULIN IS TO BE GIVEN USING A U-40 SYRINGE ONLY***This is a summary and does NOT have all possible information about this product. This information does not assure that this product is safe, effective, or appropriate for you. This information is not individual medical advice and does not substitute for the advice of your health care professional. Always ask your health care professional for complete information about this product and your specific health needs. USES: Insulin is a hormone naturally produced by the pancreas. Insulin enables the body to use the sugar in food as a source of energy. When the body does not produce enough insulin, or when the insulin produced by the body is not effective enough, this condition is called diabetes mellitus. This condition allows sugar levels in the body to become very high. Vetsulin is Purified porcine (pork) insulin zinc suspension that can help to reduce high blood sugar(hyperglycemia) and manage related symptoms. HOW TO USE: Suggested initial dosing by the manufacturer is as follows: USE CONTENTS OF VIAL WITHIN 42 DAYS OF FIRST PUNCTURE. For Dogs: 0.5 IU insulin/kg of body weight. This dose should be given once daily concurrently with or right after a meal. Veterinarians should reevaluate canine patients at appropriate intervals and adjust the dose based on clinical signs, urinalysis results, and glucose curve values until adequate control has been attained. For Cats: For cats, the initial recommended dose of Vetsulin (porcine insulin zinc suspension) is 1 to 2 IU per injection twice daily. In cats, initially administer twice-daily doses 12 hours apart concurrently with or right after meals. Reevaluate the cat at appropriate intervals and adjust the dose based on clinical signs, urinalysis results, and glucose curve/spot check values until adequate control has been attained. However, proper Vetsulin dosing for your individual pet can only be determined by your veterinarian. ****VETSULIN U40 IS TO BE GIVEN USING A U-40 SYINNGE ONLY. ****Use of a syringe other than a U-40 syringe will result in incorrect dosing. Vetsulin is administered by subcutaneous(under the skin) injection. Proper technique can be taught by your veterinarian. Do not reuse a syringe. Dispose of all syringes in an appropriate puncture-resistant disposal container. Vetsulin should be stored in an upright position under refrigeration. Do not freeze, Protect from light. Keep this medication out of the reach of children and pets. If any amount of Vetsulin is given other than what is prescribed or if you miss a dose, contact your veterinarian for further instructions. SIDE EFFECTS: 1. Rarely, allergic reactions to insulin can occur. Symptoms of this include swelling of the face/feet, hives, and trouble breathing. If any signs of allergic reaction occur, stop treatment and contact your veterinarian for further instructions. 2. The most common insulin-related side effect is low blood sugar (hypoglycemia). Symptoms of hypoglycemia include lethargy, staggering gait, seizure or coma. Contact your veterinarian immediately if your pet is experiencing any of these symptoms once Vetsulin therapy has been initiated 3. Other side effects can occur. If your pet is acting unusual in any way once therapy has begun, contact your veterinarian immediately. DRUG INTERACTIONS: In the US clinical effectiveness studies, dogs and cats received various medications while being treated with vetsulin® including antimicrobials, antivirals, antifungals, antihistamines, analgesics, anesthetics/tranquilizers, diuretics, bronchodilators, corticosteroids (cats), NSAIDs, thyroid hormone supplementation, hyperthyroid medication (methimazole), internal and external parasiticides, anti-emetics, dermatological topical treatments and oral supplements, ophthalmic preparations containing antimicrobials and antiinflammatories, and various vaccines. No medication interactions were reported. This drug was not studied in dogs receiving corticosteroids. Reproductive Safety: The safety and effectiveness of vetsulin® in breeding, pregnant, and lactating dogs and cats has not been evaluated. Use in puppies and kittens: The safety and effectiveness of vetsulin® in puppies and kittens has not been evaluated. OVERDOSE: If overdose is suspected, contact your veterinarian immediately. NOTES: Do not share this medication, needles, or syringes with others. Attend a diabetes education program to learn more about diabetes and the important aspects of its treatment, including medications, diet, exercise, and getting regular eye/foot/medical exams. Learn the symptoms of high and low blood sugar and how to treat low blood sugar. Check your blood sugar levels regularly as directed. Keep all regular medical and laboratory appointments. Laboratory and/or medical tests (such as liver and kidney function tests, fasting blood glucose, hemoglobin A1c, complete blood counts) should be performed periodically to monitor your progress or check for side effects. Keep extra supplies of insulin, syringes, and needles on hand. MISSED DOSE: It is very important to follow your insulin regimen exactly. Ask your vet ahead of time what you should do if you miss a dose of insulin.